Now that’s a welcoming sight at school!! Look at all the love and cuddles! 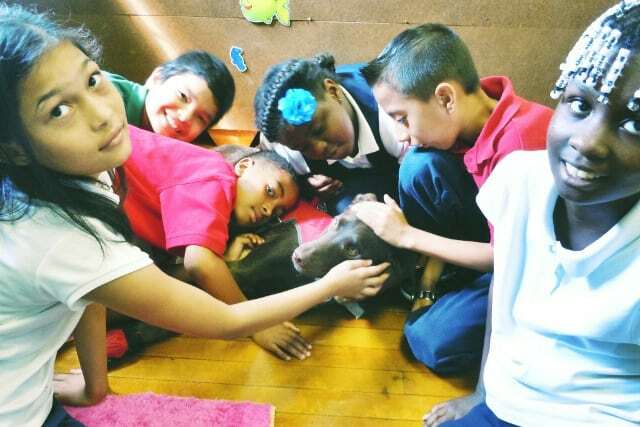 Bella and DiDi: What a lucky dog getting sweet loves from all of those kids! Therapy dogs are just amazing! One of our dogs over at Life of Drool is working on becoming a therapy dog now! His name is Harrison, any tips would be much appreciated! Oh what a lucky pup! Having all those kids love on him like that. Therapy dogs are always awesome!